It is a daunting task constructing and maintaining our school and church locations in Haiti. Thank the Lord for willing laborers. Haitian workers are eager to rebuild their country. Site inspections take place at every location, and projects are prioritized. Sometimes roofs are painted and others actually need the roofing trusses and metal roofs replaced. In other cases an inferior building needs to be torn down and rebuilt. Currently, 200 school benches are being made. Infrastructure plays a vital role with enabling our schools and churches to function. We average six new school/church buildings each year. All building materials are purchased in Haiti, and the work is completed entirely by Haitian crews. Our most common tradesmen are: masons, carpenters, and painters. In addition, we hire even more specialized tradesmen such as electricians, plumbers, and metal fabricators. Painting churches and schools is an ongoing responsibility, as we desire to keep our mission shining brightly. 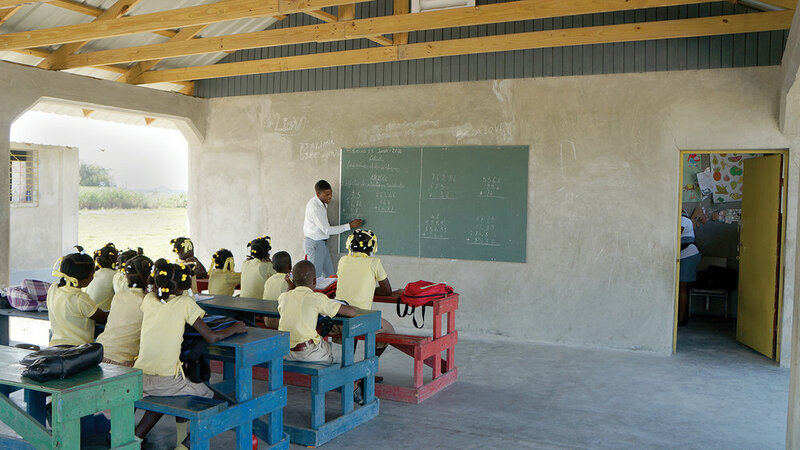 Providing local jobs, our school benches are entirely made in Haiti by local carpenters. Thank you Salem Church and Jill Brennan's class for raising funds to help build school benches in Haiti. Thank you for partnering with us in building a new Haiti. The school children love seeing their schools painted and new benches being delivered. Rebuilding and making repairs have been unending since the earthquake. From concrete work to installing roofs, we have construction projects taking place year-round. Click below to learn more about new projects for which we're seeking funding. Your giving makes a difference!